As the OP who instigated this article – first thank you – I enjoyed reading it. I hope others will not be put off by your modest and self-deprecating introduction. Third – is the title a subtle joke on surface texture? Shiny surfaces have low absorption and low emissivity while dull surfaces perform a lot better. So is ‘dull’ and in-joke? Finally, I asked elsewhere for a coherent explanation of why we get radiative cooling at night on quite a massive scale – hence inversions and even ice forming in the desert on clear nights. The issue of emissivity is very important here – both for the ground emissivity and spectrum as well as the atmospheric emissivity. I look forward to a good explanation of this as it is directly relevant to human experience and is quite probably a significant driver of local weather. I’m not sure if that’s what you’re suggesting, but emissivity is not something directly related to the color of the body. Notice that the snow & ice graph shows a nearly perfect “black body” (meaning the physical concept). And at solar wavelengths snow and ice are highly reflective, not good absorbers. That’s another bit I learned. I thought emissivity was something related to the whole spectrum of the Planck’s curve. Something like the emissivity of that body on that temperature. Apparently, it’s related to each specific frequency, that probably can be averaged to the black body spectrum afterwards. Here’s an interesting graph from Fundamentals of Heat and Mass Transfer by Incropera (2007). It shows reflectivity vs wavelength (absorptivity = 1-reflectivity for an opaque material). You can see that white paint is not reflective at all once into “longwave”. (Absorptivity is on the right-hand axis, not quite visible from the scan, but goes from 0 at the top to 1 at the bottom). I guess the dull stainless steel curve is showing the effect of wavelength dependence on surface roughness? I.e. at visible frequencies the steel is reasonably dull because the surface texture is larger than the wavelengths. At long wavelengths the roughness is smaller in relation so it becomes ‘shinier’. And the reason for the curve rather than a step-jump is because the SS roughness has a statistical distribution covering a wide range of wavelengths. I wonder about your assertion that the earth without an atmosphere would be very similar to a blackbody. Some folks are claiming to disprove greenhouse gas theory, as it is normally understood, in a novel way. They say GGT begins with the premise that without greenhouse gasses, the earth would be a perfect blackbody. The difference in temps between this hypothetical blackbody and actual temps is credited to greenhouse gasses. However, the moon has no atmosphere and it does not act like a perfect blackbody. It averages 40 degrees warmer than a hypothetical blackbody, with no greenhouse gasses. Therefore, if this is correct, the baseline for calculating the effect of greenhouse gasses on earth is way, way off. The writers of the article you cite don’t really understand the subject. Nice balloon picture, but not particularly useful to understand emissivity. In fact, the many graphs above, in the body of this article, are measurements of various surface types. They are not assumptions. The emissivity of most of the earth’s surface (in the wavelengths the earth radiates at) is close to 1. I haven’t looked at any studies on the moon, but reading the first part of the article it’s not the inappropriately-named “greenhouse” theory they are casting doubt on but basic thermodynamics. One day I will write an article about the moon.. So far as I can see, the above material is based on the currently dominant school of thought exemplified by B. Hapke’s 1993 book, “Theory of Reflectance and Emittance Spectroscopy”, Cambridge University Press, New York. The idea of this school of thought is to ignore the basic physics of propagation of electromagnetic radiation, including the infrared, at an interface between two media, and to use the term “””emissivity””” in a newly defined sense that ignores or forgets the sense in which the term is usually defined for atmospheric radiation studies. The effect of the influence of this school of thought is hard to assess, because it is followed by many of today’s experts, who value time-saving speed and efficiency above scientific accuracy. In 1858, two years before Kirchhoff’s celebrated 1860 paper which earned him the reputation of originating his law of radiation, Balfour Stewart explained the correct physics which is ignored by the currently dominant school of thought. The correct physics was noted by Rayleigh in 1900 and is also used by Planck in his 1906/1914 book on heat radiation, and is also noted in Born and Wolf’s “Principles of Optics”, 7th edition, 1999, at page 423, but not even these sources have reached the quick and efficient currently dominant school. The correct physics is reviewed by R.J. Potton (2004), ‘Reciprocity in Optics’, “Rep. Prog. Phys.” 67: 717-754. In 1858, Stewart explained that each medium has its own intrinsic material emissivity, in the sense of emissivity used in atmospheric studies today. But at the interface between two media, there occurs reflection, because of the discontinuity of the optical properties at the interface. The reflectivity is a specific property of the interface, not of either of the media separately, and this property needs to be specifically considered in an account of propagation of light (including IR) at the interface. It was discovered by Stokes in 1849 and later by Helmholtz that there is a principle that the reflectivity is the same whichever is the sense of propagation of light in a given direction across the interface. This is explained in some detail in J. Lekner’s 1987 book “Theory of Reflection of Electromagnetic and Particle Waves”, Martinus Nijhoff Publishers, Dordrecht. The principle here has nothing to do with emissivity and absorptivity of molecules that is the concern of quantum mechanics and of atmospheric radiation studies. This principle is about macroscopic interfaces considered purely in terms of classical physics. It states that when a beam of light hits an interface, the energy that penetrates the interface plus the energy that is reflected from the interface is equal to the total energy of the incident beam, and that for a given interface, there is a specific property of the interface, its reflectivity, which is the ratio of reflected to incident energy, and that in a given direction, the reflectivity is the same for a beam incident in either sense, for example from the condensed matter medium to the gaseous medium, or from the gaseous medium to the condensed matter medium. and Su = r Ed + (1 − r) εσ T^4. So far as I can see, the above blog entries are made according to the currently dominant time saving quick and efficient school of thought that neglects this simple, basic, and long established physics. r and ε are apparently not separately measured, which they ought to be. 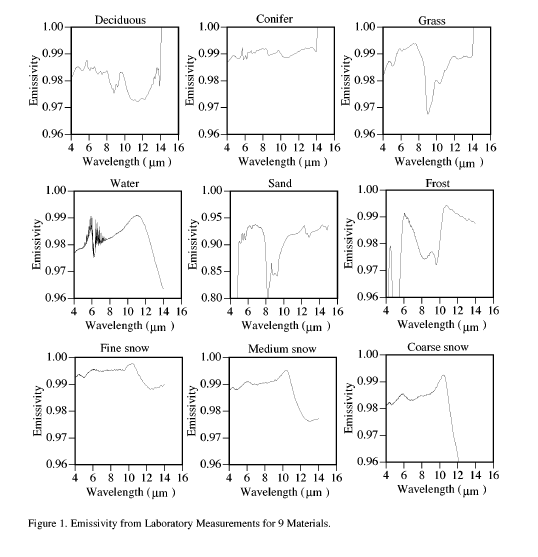 Absorptivity + transmissivity + reflectivity = 1, where each is a function of wavelength. From Kirchoff’s law, ε(λ) = α(λ) for a diffuse surface. So measure reflectance at each wavelength and you know the emissivity. When I read your extracted comment it sounds like you agree but in other parts of your comment you don’t agree, for reasons that aren’t clear. replying to scienceofdoom’s post of 2010 Jul 19 7:06 am. The formulae you quote are quick and efficient but are not good physics. I was just writing about the interface, which can allow fractions of the beam to penetrate or be reflected; that’s all it knows about; it doesn’t know what will happen to the penetrating fraction. The transmission that appears in your quick and efficient formula does not refer to the interface, but to to the layer of material behind the interface, about which the interface does not know. The physics for an interface is as I wrote. I just made a slight slip, in that I wrote of “the direction” of the beam. What I should have written was of ‘the path’ of the beam, which is refracted at the interface. I suggest you read Planck 1906/1914 to get the right physics, if what I wrote is not clear to you. The other references I gave are also valid. The formulae you quote are quick and efficient but are not good physics.. I don’t have a copy of Planck 1906/1914 – why don’t you explain in your own words what is actually wrong with the formula. Absorption + reflection = 100% – how should this be improved? Absorptivity = emissivity – how should this be improved? replying to scienceofdoom’s post of 2010 Jul 19 12:23 pm. The formulae absorption + reflection = 100% and absorptivity = emissivity are not exactly the formulae that you quoted in your previous post. You have been quick and efficient in translating between the formulae. At this level, the proper formula for the interface is penetration + reflection = incidence. This is conservation of energy. The interface does not know what will happen to the three terms of this formula when they are propagating apart from it. It does however sustain a relation between penetration and reflection, a coefficient of reflectivity. The ‘reversion-reciprocity’ principle requires that the coefficient of reflectivity for each ray is the same in either sense, from condensed medium to gaseous medium or from gaseous medium to condensed medium. The reflection is determined by the discontinuity between the two media, and is not a property of either alone. It needs direct measurement, distinct from measurements or calculations of absorption and emission. The interface is a notional geometrical two-dimensional surface of discontinuity of material properties, and has itself no volume and material mass, and so can neither absorb nor emit radiation of itself. It can only see propagation of radiation to and from elsewhere. The radiations within the separate media are their respective private businesses, not to do with each other; this refers to propagation beyond, not at, the interface; within the respective separate media we mean that there is no discontinuity of properties to require reflection. Propagation within the respective media is governed by laws of absorption and emission, because it refers to respective three dimensional material media, with their respective mass densities and other material properties. The formula you quote here, absorption + reflection = 100% mixes up what happens at the interface with what happens within the respective media. It fails to recognise ‘reversion-reciprocity’ of reflection at the interface. As for the formula absorptivity = emissivity, it comes with careful definitions and conditions for its applicability; it is possible to mistake those definitions and conditions. I will not right here discuss this point, but will just say, let’s get the previous formula right first before moving on to this one. It is regrettable that some textbooks, that should know better, do not bother to get this right.